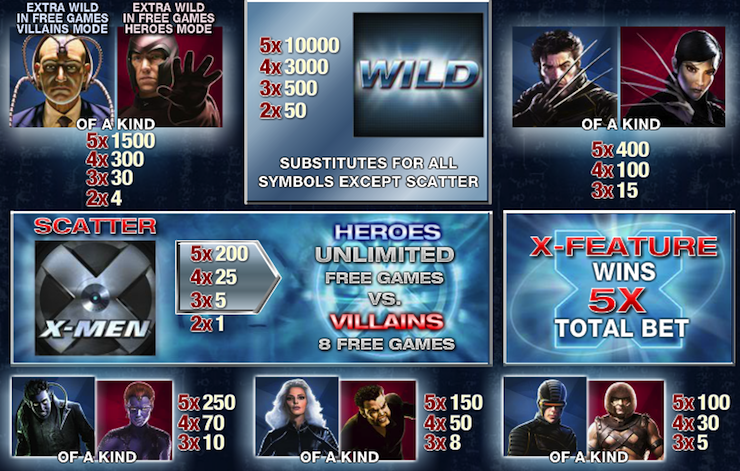 Created by Playtech, the X-Men slot surpassed all expectations of Marvel comics fans. The game has proved to be a big hit with slots and comic book fans alike. The slot game employs the theme of movie series, where five super heroes fight against super villains, so get ready for a super fight! Courtesy of the world-known Playtech, the slot offers beautifully drawn characters, dazzling animation, top-tier graphics and world-class audio. Perfectly combining classical slot traditions and cutting edge technology, the X-Men slot has 5 reels, 25 payout lines, 41 winning combinations, 4 progressive Marvel jackpots, and bonus games. If you can put together 5 heroes in the form of an X in the middle of the slot or spin 5 identical characters, you get fantastic payouts that will knock you off your feet! The X-Men logo is the scatter. Three or more scatters initiate free spins. You can play the X-Men slot, as well as many other amazing slots, at our site for free, with no registration needed.